Whimsical Fine Arts – Whimsical Fine Arts Whimsical Fine Art - Art by Rolandas Kiaulevicius Dabrukas - Lithuanian Artist Living in Los Feliz/ Los Angeles - Whimsical paintings, drawings, illustrations, murals and more! Zoolidays is a children’s book about the animals of a fledgling zoo that is about to close down due to lack of business. Since the animals are all in danger of losing their home they must think how to get the patrons to come back. Nowadays, for an artist to attract people, it is not enough to have only canvas, paints and brushes; this is what motivated these artists into searching for something more exciting to present their art. Besides their favorite activities – illustrating books, teaching students art secrets – the most adrenaline they get is from painting while standing on walking stilts. Need Art For Your Walls? You are invited to browse in my Shop, where you can find both original artwork and high quality giclée prints of my work. Greeting cards, books and apparel featuring my work are also available for sale. Get lost in the aisles of my store! I, as the illustrator of the book “Zoolidays,” will be delighted to present the book to children – telling the story of how animals painted each other to save their zoo. 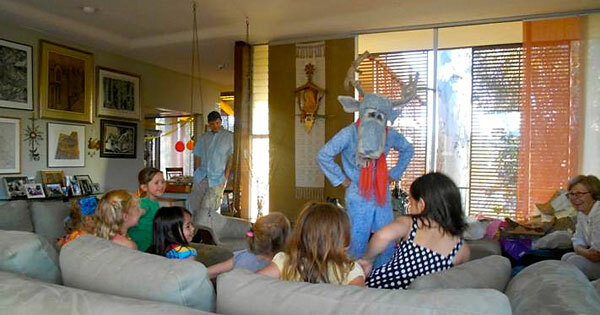 I will act out the story of the book dressed up as the fantastic blue moose, one of the characters in “Zoolidays”. Why have walls if you can have murals?! I work hand in hand with my clients during the design of the custom mural, making sure that they are always happy with the depiction on paper before I proceed with my first paintbrush stroke on their wall. I suggest to my clients to first browse my the mural samples available in Gallery in order to see what I have done for clients in the past.